A new twist for solitaire lovers! 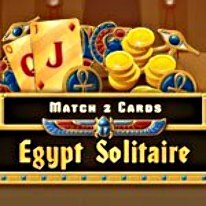 Egypt Solitaire - Match 2 Cards isn't your typical solitaire card game. Enjoy 120 unique card deals in a mysterious Egyptian setting and encounter the mysterious Sphinx, the pyramids, and enter the tomb of an old king. - Change your difficulty mode and complete 120 levels twice! - Challenging achievements and trophies!